PFM – EMS Medium Edition | Nexbridge Inc.
PFM offers a unique way of processing and presenting EMS messages by shifting the workload from NonStop™ Servers to workstations. Using the power of the Java 6 Runtime Environment, couple with a unique understanding of how the NonStop Event Management System behaves, Nexbridge has developed a suite of facilities for getting the most out of EMS without wasting precious CPU cycles on your NonStop Servers. The heart of PFM is the EMS/SPI core parser; a Java class library that knows about the internal format of the Subsystem Programmatic Interface (SPI) message buffer. It converts EMS messages into workstation-based objects that can be easily processed by application programs. The EMS/SPI core parser can run entirely on a workstation, so that all processing is offloaded from NonStop Servers. Note that SPIBridge™ is a required component. 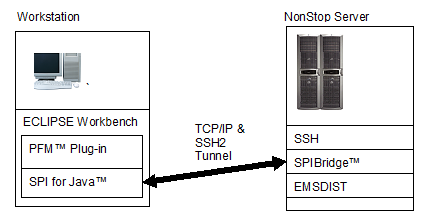 RETool communicates with EMSDIST using the SPIBridge™ client and server using SPI for Java™. EMSDIST acts as a consumer distributor and performs message pass-through for up to ten EMS collectors. Using SSH for communication, PFM ensures that confidential event data is not visible in-the-clear on unsecured networks. This means that even support staff operating remotely can securely monitor EMS. This product has many variants. Please discuss your needs with your Nexbridge sales associate. 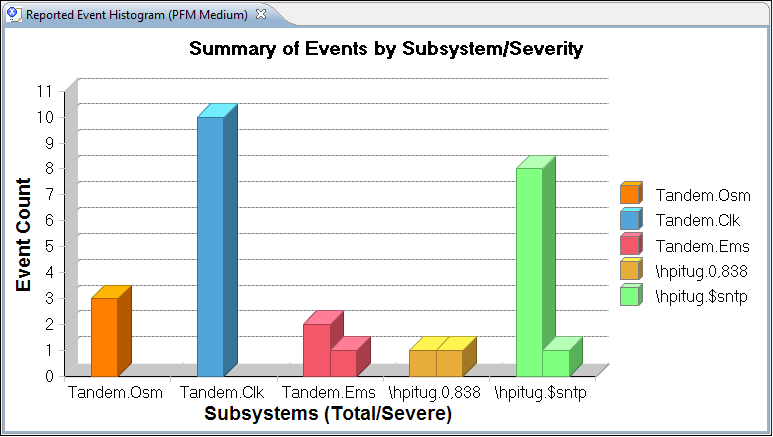 PFM has a simple view of events, with a single table showing all events. Selecting an event immediately shows the cause, effect, and recovery information, if available in EVENTTD, any available EVENTCX files, or XML description files that can be created for any language. The table can be simply sorted by clicking on any column header. The Event Text column displays either the values any available template in the system configured template file, and/or any other file set that you specify. PFM Medium supports at least ten template files. Template files are cached locally. They are downloaded when PFM runs initially and automatically after the files change. PFM also reads the system configuration from $ZZKRN to determine the current template file in use. 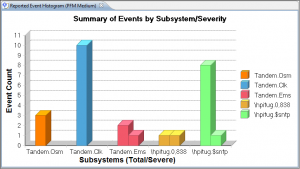 By clicking on the chart icon, users direct PFM to compute a histogram of events, by subsystem or process, with a separate bar for those with emphasis. This allows you to quickly identify subsystems that are contributing to problems on your system. Users are also able to specify host-based filters. Configured using ECLIPSE Preferences, users can specify up to ten filters that EMSDIST will apply before sending events to PFM.